1. Preheat oven to 400ºF. Wrap potatoes and beets with aluminum foil separately. Bake potato for about 1 hour and beets for 75 minutes. When they are done, leave them on the the counter until they are cool enough to be able to handle. 2. Peel skin from potato and beets. Pass the potato through a ricer or a food mill. If you don't have a ricer or a food mill, use a fork, a masher or a box grater. If you want, press the potato through a small mesh thieve to make them very smooth. Put the peeled beets into a food processor and run until the beets are very smooth. Mix potato and beets in a big bowl and combine well. 3. 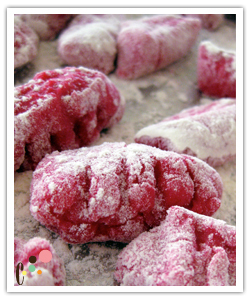 Flour the surface of the counter, make a mound of potato and beets mixture and make a well in the middle. Add egg yolks, parmesan cheese, salt, pepper and nutmeg in the well and mix them very well with your hands. 4. Add 1/2 cup flour and mix into the potatoes. Keep adding 1/2 cup flour, mix and fold until the dough is still soft but dry enough to handle when you roll it. 5. Flour the counter again and divide the dough into 8 pieces. Roll each piece into a 1/2-inch diameter rope then cut into 3/4-inch long pieces with a knife. 6. Squish each pieces of gnocchi gently with a back of a large fork to make the ridges and set them aside on floured baking sheets with parchment paper or kitchen towel (not paper) and dust with more flour on top of the gnocchi. 7. At this point, you can freeze them on the baking sheets or cook them. Cook them in simmering hot water until the gnocchi rise to the water surface. Give them another minute in the water and remove them from the water. Toss them with olive oil. If you don't eat until later that day, you still need to cook them, coat with olive oil and refrigerate until time to eat. Right before you eat, reheat the gnocchi with hot water for 30 seconds. 8. Mix with your favorite sauce. 1. In boiling water, put some salt (extra) and cook beet greens for a minute. Remove from the water and put them in ice water. When they are cool, remove them from the water and get rid of the water as much as you can and set them aside. 2. In a large saute pan, add heavy cream and butter. When the butter is melted, add parmesan cheese, salt and pepper and mix well. 3. Add wilted beet greens and gnocchi and mix them well. 4. Serve them with some more parmesan cheese on top.